Chad Saylor graduated from IPR’s audio production and engineering program. Learn more about his journey and how his education impacted where he is today. I currently work for Music Group (the parent company Uli Behringer owns that includes Behringer, Bugera, Midas, Turbosound, TC Electronic, TC Helicon, and Tannoy). I am one of the four technical advisors for North America, South America, and Australia. Basically, I am the one of the guys the front of house or monitor techs from huge acts like Blake Shelton to Memphis May Fire call to troubleshoot and remotely fix their equipment. Aside from that, I’m actively involved in the Las Vegas music scene as a Front of House engineer at a local venue called The Space, in addition to being an artist/performer. I enjoyed being able to have a great song idea at two in the morning and have access to a beautiful recording studio to get it on tape was one thing for sure. Another thing I enjoyed was the people. I’m from a pretty small town north of Pittsburgh and I found so much culture while at IPR. I learned about new customs, music, and styles from people who were from all over, which has definitely shaped who I am today. The last thing I’ll mention would be spending time with Tom Tucker in his office talking about oldies records, Phil Spector, and Brian Wilson. I remember how shocked and pleased he was with my taste in music and that was the icing on the cake. I found very production class that I took with Kevin Bowe most helpful for my career. I learned so much about how to work with an artist in the studio and coach their best performances. 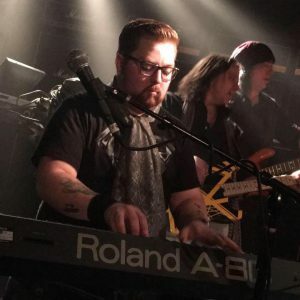 I also learned a lot from his songwriting and miking techniques, which I use frequently my live sound work. I also really treasure the classes I took with Pamela McNeill because more than anything, she was supportive of every dream or song idea I had. I didn’t know until later on how much effect the one on one support and conversations I had with her really gave me the confidence to do things my way and be creative and open. Are there any specific parts of the training you received at IPR you feel are very important for the job role you are currently in? Studying the signal flow of the SSL G Series in Consoles was absolutely a necessity for what I do today. The majority of issues I deal with on a daily basis are faults within signal flow and why signal may be going one direction when it should be going another. I actually still have the SSL signal flow diagram poster from that class and, up until my recent move, was always hung framed somewhere in my home. How has your experience at your current workplace helped you expand your skillset in audio? I have learned how to repair issues when before, I would be the one sending it to a service technician to resolve the issue. What’s great about where I’m at is that there are so many opportunities to learn new things and skills. If you’re a studio guy, there’s gear and knowledge everywhere for live sound. If there’s anything I’ve learned from my time at Music Group so far is that being a jack of all trades is priceless and in today’s current audio workforce, is an absolute necessity. The best advice I received while at IPR was from Tom Tucker. I specifically remember talking to him quite a lot about my concerns with being a small fish in a big pond and I’ll never forget him telling me that the key was to just be you. To this day, that’s what’s carried me to where I am– and to Tom I’ll always be grateful. Being successful, I’ve learned over the years, is completely subjective. I thought success was a Grammy award or a platinum album. Today, I feel it’s more about how accomplished I feel at the end of every day and that I’m paying my bills doing what I love to do. How important do you think attitude is when it comes to success? It’s everything. There a lot of stressful situations that can take place when you’re working a show or a studio session. You have to remember you’re human and that sometimes because you’re dealing with electronics, there are things that are out of your control. I’ve had events where the outputs went out or there was one time when there was a ridiculous feedback anomaly that still came through even when everything was muted. Being calm and positive as well as focusing on what you’ve learned from your education and experiences is something that does not go unnoticed by either the artist or your employer. Learn as much about everything that you can. Learn live sound reinforcement, MIDI, how to solder cables and circuit boards, and definitely learn how to use a compressor! If you can fill any void then all you have to do is put yourself out there. Move somewhere unexpected, take chances, and stay positive. What was your first industry job after graduation? I was hired by Beatlemania Magic, a touring Beatles tribute show to create the backing tracks (from scratch!) for them to be able to perform Sgt. Pepper live. It was challenging to say the least, replicating one of the greatest albums of all time and to do it with a deadline. Are you doing today what you thought you would be doing when you started school? Definitely not! When I started at IPR I wanted to be a hit songwriter and producer as well as a successful solo act. I was way more focused on the creation and recording aspect back then. I hope to continue to grow as an engineer and repair technician. Moving forward with Music Group and dealing with situations in person as well as working with more amazing artists in the field. I learned that there’s someone just like you but better everywhere. There’s always someone who is out there trying to take your job from you, whether it’s undercutting you on your rate, or offering some extra perk that you just can’t provide. If you could change anything regarding your career path, what would it be? I wouldn’t change a thing because if I did, I may not end up where I am right now and where I’m at is exactly where I want to be. Click here to learn more about the audio production and engineering program at IPR.